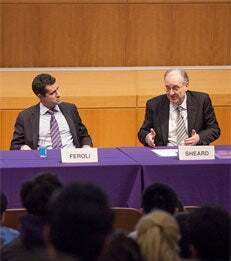 On February 4, Kim Schoenholtz, Professor of Management Practice in the Stern Economics Department and Director of the Center for Global Economy and Business, moderated a discussion among three leading economists from Wall Street firms. Michael Feroli, JP Morgan; Paul Sheard, Standard & Poor's; and Nathan Sheets, Citigroup each made a brief presentation regarding economic and market prospects, followed by discussion and audience Q&A. The Stern Center for Global Economy and Business aims to promote faculty research, housing several research groups that explore the global aspects of modern economies and business. The research group on central banking is pleased to sponsor the Stern Economic Outlook Forum.